A 3-D image of a tooth filled with nanodiamond-enhanced gutta percha, and an individual gutta percha point. People undergoing root canals may have gained a powerful, if tiny, new ally. Researchers from the UCLA School of Dentistry have found that using nanodiamonds to fortify a material used in the procedure could significantly improve outcomes for patients. A paper on their research is published in the current issue of the peer-reviewed journal ACS Nano. Nanodiamonds are tiny particles formed as byproducts of diamond refining and mining. Thousands of times smaller than the width of a human hair, they have been widely explored for use in dentistry, cancer therapy, imaging and regenerative medicine, among other applications. Each year, more than 15 million root canal procedures are performed in the United States. Dentists’ goal is to save their patients’ teeth from infected dental “pulp” — the part of the tooth that includes blood vessels and nerve tissue. During a root canal, inflamed dental pulp is removed and the empty space is then filled in with a polymer called gutta percha, which is used in part because it does not react within the body. But some root canals don’t entirely remove the infection, and residual infection after root canals can lead to tooth loss. In addition, traditional gutta percha has certain shortcomings, including a limited capacity to ward off infection and less-than-optimal rigidity. To overcome those issues, the UCLA team developed and tested two types of reinforced gutta percha: One strengthened with nanodiamonds and another strengthened with nanodiamonds that had been pre-loaded with antibiotics. To evaluate the first type, Sue Vin Kim and Adelheid Nerisa Limansubroto, study co-authors who are UCLA Dentistry students, filled actual teeth from human patients. Using conventional radiography and micro-computed tomography, or micro-CT, they showed that the nanodiamond-enhanced gutta percha could be used to fill the tooth. Like the traditional formulation, the nanodiamond-enhanced compound did leave small gaps in the canal — where harmful bacteria could grow — but the CT imaging showed that the enhanced material filled the space just as effectively as traditional gutta percha. 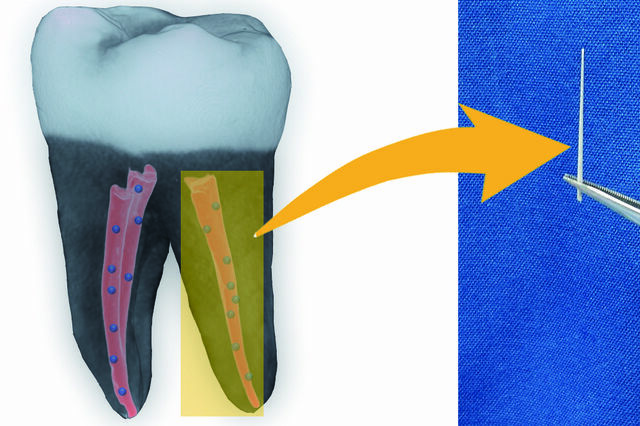 “Validating this novel material in teeth extracted from patients serves as a strong foundation for the potential translation of nanodiamond-reinforced gutta percha toward clinical testing,” said Dean Ho, a senior author of the study and a professor of oral biology and medicine and co-director of UCLA Dentistry’s Jane and Jerry Weintraub Center for Reconstructive Biotechnology. In the research’s second phase, the scientists tested nanodiamonds that had been loaded with amoxicillin, a broad-spectrum antibiotic used to combat infection. The drug-reinforced nanodiamonds, when combined with the gutta percha, effectively prevented bacteria growth. “The nanodiamond-enhanced gutta percha combines many desirable properties into a single platform, including vastly improved mechanical characteristics and the ability to combat bacterial infection following a root canal,” said Dong-Keun Lee, a postdoctoral scholar in Ho’s lab. The study involved UCLA researchers with expertise in a wide range of disciplines — materials science, nanotechnology, drug delivery, toxicology, oral radiology, endodontics, microbiology and other fields. “Through their ingenuity and collaboration, Professor Ho’s team is poised to transform the way that dentistry is practiced,” said Dr. No-Hee Park, dean of UCLA Dentistry and a co-author of the study. During the next two years, the team plans optimize the formulation of the nanodiamond-reinforced gutta percha and begin clinical trials at UCLA. Ho is also a professor of bioengineering and member of the UCLA Jonsson Comprehensive Cancer Center and the California NanoSystems Institute at UCLA. Other authors of the study were Albert Yen of the UCLA department of bioengineering and UCLA Dentistry; and Akrivoula Soundia, Yong Kim, Wenyuan Shi, Dr. Christine Hong, Dr. Sotirios Tetradis, Dr. Cun-Yu Wang and Dr. Mo Kang, all of UCLA Dentistry. The study was supported by the National Cancer Institute, the National Science Foundation, the Wallace H. Coulter Foundation, the V Foundation for Cancer Research, the Society for Laboratory Automation and Screening, and Beckman Coulter Life Sciences.